This week I presented a new generation of lifecharm data shells at a symposium on ethics in data science for the Alan Turing Institute. 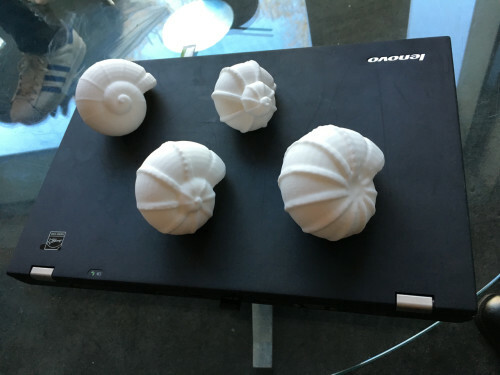 The shells were created by Stefan Kueppers using the Lifestreams process for data manifestation, and used data from a research project led by Professor George Roussos at Birkbeck University of London which records symptoms of Parkinson’s Disease as experienced by sufferers. These shells are an initial experiment flowing just 3 data sources into the shell growth parameters, which we hope to expand with further data sources and increase the complexity of the model in future generations. The aim is to capture the high variation in symptoms experienced by those with Parkinson’s as an alternative to the way in which patients’ complex symptoms are collapsed into the single summary statistic of the Universal Parkinson’s Disease Rating Scale. Read my provocation piece for the ATI symposium for more information.